With a great deal of infrastructure work on the horizon, many problems will arise in trying to do work around existing buildings, roads and other structures. Billions of dollars in federal aid money have been allocated to rehabilitating decaying sewer systems. While these are projects that will be done, there will be associated problems with trying to keep roads and businesses open during work. In rehabilitating existing sewer lines, typically the flow of sewage cannot simply be diverted; it must be “bypassed”—or temporarily pumped around the pipe being repaired or replaced. To do this, pumps capable of pumping trash- and sewage-laden effluent are used. The pumps are installed upstream of the faulty pipe. A temporary pipeline is installed from the pumps downstream of the pipe to be repaired and back into the existing sewer line. Temporary plugs are set in place between these points to allow the pipe to be removed or repaired. Depending on the number of homes or businesses serviced by the sewer line, the bypass may handle sewage from a few to several thousand gallons per minute (gpm). This is a very simplified description of a bypass; there are many associated factors that require the work of specialty bypass companies. In order to select the proper pump and equipment, bypass contractors need to know peak flow; sewer line pipe size; sewer line pipe depths; duration of the work; access issues; and any other factors associated with a particular project. The peak flow is the highest flow on the pipeline throughout the day. This usually occurs in the early morning when people are getting ready to start the day and a lot of water is being used (e.g., bathroom, showers, etc. ), and again in the afternoon when they return home. Special consideration should be taken during peak flow times such as the Super Bowl. Peak flow will usually occur during halftime and could cause a considerable problem during a bypass if not considered or handled correctly. The peak flow must be known in order to properly size the bypass pumping system. The peak flow is not the average daily flow, and when it is not known or is inaccurate, serious problems can occur—for instance, sewage spills, which are very costly. Once started, some bypasses cannot be stopped. If additional pumps are necessary, every measure must be taken to prevent a spill from occurring. The depth of the sewer pipeline and acceptable effluent/sewage level within the pipeline must be known to properly select a pump. The proper type of pump is predicated on this depth level. If the sewer line is deeper than approximately 25 ft, submersible pumps must be used. In this case, the submersible trash pump is lowered into the pipeline opening and connected to the temporary discharge pipeline. If the sewer line is shallower than 25 ft, then above-ground non-clog or trash pumps may be used. In this case, a suction pipe or hose is lowered into the pipeline opening, leaving the pump above ground, and again the pump is connected to the temporary bypass pipeline. Generally, suction lifts greater than 25 ft are not practical because the flow capacity of the pump will be greatly affected by the deeper suction depth. Additionally, the net-positive suction-head requirement (NPSHr) of the pump—the head pressure that causes the effluent to flow into the pump, whether it is atmospheric or other positive static pressure—should always be taken into consideration because many pumps do not work in applications where there are significant suction lifts. Not taking the NPSHr into consideration will likely result in a sewage spill when the pump does not keep up with the flow. Some bypasses can take as little as a few minutes, while others may go on for months or years. Some projects can be shut off at the end of the day, but the majority will need to run 24/7. Projects lasting less than a day are naturally less intense and problematic. Many safety steps need to be considered in 24/7 operations. Generally, it is a good idea to have a properly trained and equipped pump watchman who can oversee operation and react to any problems. On long projects, things to consider include: adding staff to maintain the system; alarm systems; additional backup pumps and fittings; emergency 24-hour contacts; city requirements in regard to noise pollution; traffic/access control; and many other items that may not be apparent from the beginning but need to be resolved prior to starting any bypass. On occasion, a bypass will occur in a remote area where there is ample space for installation. Most bypasses, however, will occur in busy public areas where little bypass-related disruption can occur. This leads to access issues in which the proper equipment must be installed to safely accomplish the work while minimizing the amount of space required for the installation. Road installations or those near buildings will limit access for both equipment installation and operation. Traffic diversion may be necessary for road installation, or a road may need to be shut down. In some instances, the suction or discharge pipe must be routed to and from the pumps and may need to be buried to allow continued use of the roads or facilities. Additional items such as curtains for sound attenuation or aesthetics may need to be installed. Should the bypass be of long duration, ample room for routine maintenance must be made available. In bigger flow bypasses, multiple pumps may be required that will add to the footprint of the equipment. It cannot be assumed that the installation or operation can be done without proper planning and permitting from local governing bodies. Replacing or repairing faulty pumps. 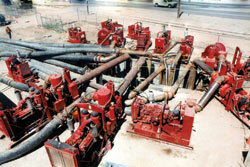 Bypass pumps and equipment are available in a variety of options and materials. Typically, any piping will likely be high-density polyethylene, steel or PVC, where allowed. Hose used needs to be of rugged construction and usually will be specified as to the type allowed. Any valves would generally be the type that prevent sewage from tangling on obstructions. The pumps themselves are the most important element of a bypass. All pumps are bound by the laws of physics. At sea level, the theoretical maximum suction lift for water (specific gravity of 1) of any pump under a perfect vacuum—whether self-priming, vacuum-assisted, diaphragm-assisted or compressor/venturi-assisted—would be 33.9 ft. However, other factors limit the pump to a “practical lift” of substantially less—more to the order of 25 to 28 ft. Submersibles are needed at deeper settings because they are not limited by suction lift and “push” water up. For bypasses with suction lifts of less than approximately 25 ft, typically an above-ground self-priming or prime-assisted pump should be used. Again, the NPSHr of the pump will play a significant role in the proper selection. A self-priming pump will prime itself as long as it is full of water. It is generally the easiest to use, consisting of a pump and its driver. A suction hose or pipe is inserted into the manhole or sewer line opening and connected on the suction side. Then a discharge hose or pipe is connected on the discharge side. The pump chamber is filled, and the pump is turned on. These often are used where priming time is not critical. A prime-assisted pump will prime itself under dry conditions. Generally, prime-assisted pumps will prime more quickly than self-priming pumps. They consist of a pump, driver and priming device, which may be a vacuum pump, diaphragm pump or compressor/venturi. A vacuum-assisted pump is quickest due to the air-handling capability, followed by the diaphragm assist, then the compressor/venturi setup. For bypass pumps with lifts of greater than 25 ft, submersible pumps must be used. They are also offered in a variety of types. Most common will be electric motor-driven and hydraulically driven, which consists of a hydraulic power unit, hydraulic hoses and a hydraulically driven submersible pump. Applications depend on whether an electric-driven unit poses a safety issue. When it comes to pumps and equipment, general knowledge of pumps alone is not enough. Experience in setup, installation and maintenance of vital construction works is the best tool for these type of projects.